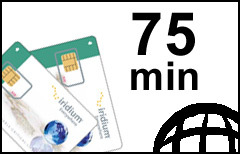 Iridium 75 minutes Prepaid Plan can be a great option if you want to try Iridium satellite service before committing to a larger amount of minutes. IMPORTANT! Do not purchase a new plan if you just want to add more minutes or extend validity of your existing Iridium account with SATTRANS. Get a new Iridium airtime voucher instead.